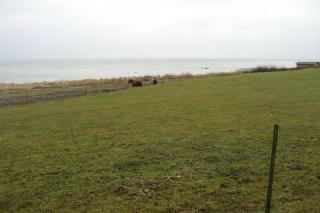 Where meadows and forest meet the shore north of Lundeborg on Funen was once one of the largest trade centres of the Iron Age. Along a stretch of almost 1,000 metres, finds have been made of huge layers of refuse from around 200 AD to 700 AD. And these finds are overwhelming: thousands of artefacts point to the presence of skilled craftsmen as diverse as iron smiths, bronze casters, comb makers, boat builders, amber polishers, together with silversmiths and goldsmiths, gemstone-polishers and even bead-makers. Today, by the quiet shore, it is difficult to imagine this was once a hive of Iron Age activity. Apparently not – no traces have been found of dwellings of any size at the site! It is likely that any human shelters by the coast consisted only of lean-tos, tents etc. because the site was only used for summer markets. But in the village of Gudme, 5 km from the coast, there is evidence of a large settlement from the same period. The contents of the dwellings here indicate an unusual prosperity in the form of many gold artefacts and rare, imported luxury items from the remote Roman Empire. Today at Gudme, the contours of Prince of Gudme's Hall" are marked out to give a sense of the grand scale of this former building. It was perhaps the Prince of Gudme who presided over the market at Lundeborg and housed the permanent settlers and market-goers. " Himlingøje Was this where Denmark's cradle stood?